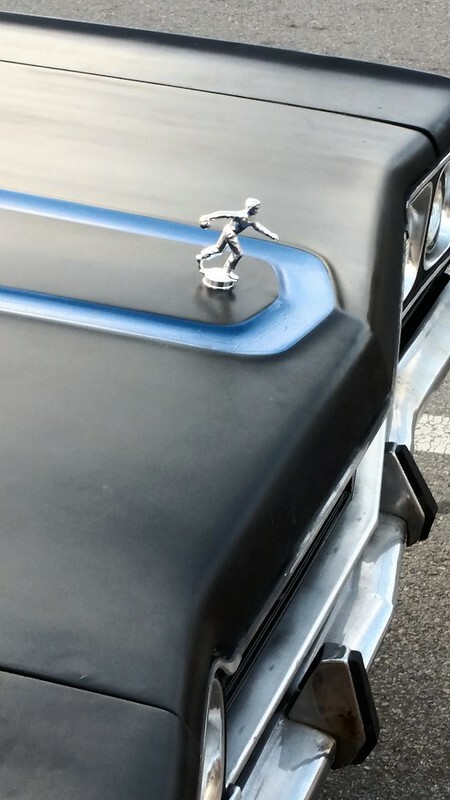 A bowling trophy piece replaced as a hood ornament on a car. We all see strange and curious things when we are out and about. Of course, when in a city or suburbia, we see a lot of cars and vehicles. Many of which we all but ignore--they are so common that they become part of the background noise and visuals of our daily lives. But you do regularly encounter a car that grabs your attention for one reason or another (and this is coming a self-identified "non-car person"--that is, I just need a car to have an MP3 CD player for audiobooks and know where to put the gas; otherwise, I really don't care what kind of car I drive). However, this car first caught my eye because it's black and blue design was distinct, not because you don't often see cars with more than one color, but because the paint didn't seem like regular car-paint. It might have been spray paint, but it stuck out regardless. So when I looked at it, I also realized that the hood ornament was not your standard ornament. Whatever it was, it was now the standard bowler for a bowling trophy and I couldn't help but laugh at the distinct way this owner was decorating his or her card.